View More In Square & Rectangular. 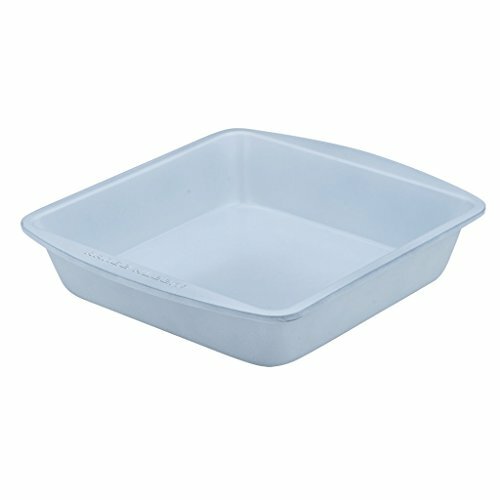 Enjoy every minute of baking with the Range Kleen BC3000 CeramaBake Square Cake Pan. The Pan is ideal for baking not only square cakes but also brownies, cookie bars or a small lasagna. This elegant, bright white bakeware uses an innovative ceramic technology coating that is not only easy to clean and stain resistant, but is also non-stick and ensures premium food release. The aluminized steel construction offers durability and even heating. This nice pan is suitable for any baking temperature and comes with a 5-year limited household warranty. A BAKING MUST HAVE FOR ANY BAKING SETUP: The Range Kleen BC3000 Ceramabake Round Cake Pan is designed for baking square cakes, cookie bars or brownies. Give your baking setup a clean and neutral white look with this fundamental bakeware. FINE CRAFTED BAKEWARE: With the square form measuring 8 inches, the heavy duty, aluminized steel offers durability and even heating. It also has a nonstick interior that ensures premium food release. ENJOY NO WORRIES IN BAKING: Being the only white on white ceramic coated bakeware on the market; this pan is suitable for any baking temperature. The curved rims on sides allow for easy handling. BAKE AND CLEAN AWAY: The bake pan has no PFOA and PTFE, and reduces cleanup time as it can go from oven directly to table for serving. It is stain resistant bakeware, dishwashing safe but also cleans easily with hand washing. COMPATIBLE TO MOST KITCHENWARE: The sides of the pan encapsulate food and the white ceramic adds an immaculate touch for your kitchen accessories. Manufacturer: RANGE KLEEN MFG., INC. Publisher: RANGE KLEEN MFG., INC. Studio: RANGE KLEEN MFG., INC. If you have any questions about this product by CeramaBake, contact us by completing and submitting the form below. If you are looking for a specif part number, please include it with your message.